My gaming group – after 2.5 years of thoroughly non-organised play – has taken to pitching potential new games and adventures. This has come as something of a shock to the system, but its makes sense as we only get together once a week and we don’t want to waste any valuable time in that session not knowing what to play. 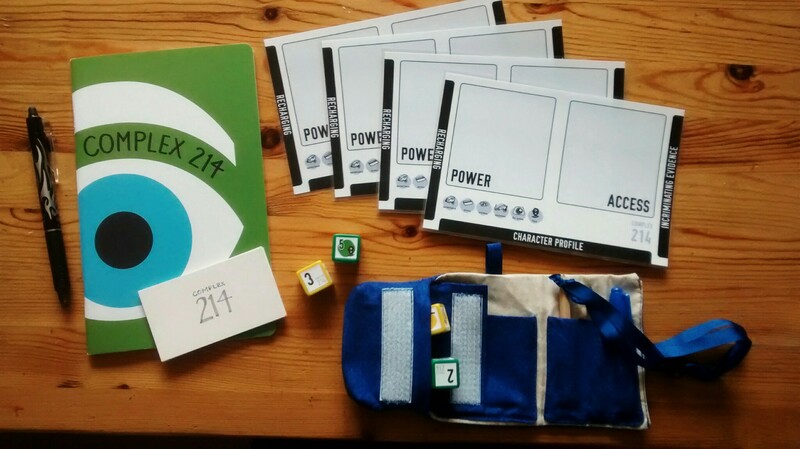 With an eye to running sessions of Complex 214, to help me develop the rules, setting and adventures, I have added my game to the pitch list. Necessarily, this required I write up a brief pitch. Tales of a dystopia driven by fear, bureaucracy and a low level of life expectancy. Born from vats, trained to fill roles with a minimum level of ambition and competency, you live to work and serve the community first and foremost. Think Brave New World, 1984, Brazil, Memoirs Found in a Bathtub and similar stories of man versus monolithic bureaucracy and smothering mother state (possibly even think about a game called Paranoia). As Complex 214 is my own system, in a state of ongoing development, I need to run this more than once. Every chance I get, I need to give it a go and garner feedback. I will push it at events and conventions, as well as at my gaming group and through Hang-outs. The more the merrier. Initially, as I want to focus on refining the rules, I will use adventures from other existing games – like running Stealth Train for my first session. Once I have a firmer grasp on a reliable set of rules, I will start writing up my own adventures. Yesterday, I had a brief tweet-versation with Dan Curtis Johnson about his Paranoia missions – given the success of Stealth Train at the weekend. He directed me to The Lightbulb Mission, one of several missions included in Service, Service! As I wrote two missions for this book, I suppose it should have occurred to me earlier as a potential source of test adventures! The Lightbulb Mission might well prove a worthy candidate – though I’d be surprised if it hasn’t also been used by disreputable agencies in various countries as a means of progressive torture.